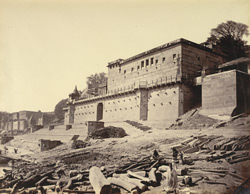 Chhattra or Raja Ghat [Benares]. bl.uk > Online Gallery Home	> Online exhibitions	> Asia, Pacific and Africa Collections	> Chhattra or Raja Ghat [Benares]. Photograph from the riverside looking towards the resthouse from 'Views of Benares, from the River Side' taken by Brajo Gopal Bromochary in 1869. "The flight of stairs rising from the Ghat enters to the large and massive house in the front, which has been built by Raja Amrita Rao for the charitable entertainment of the poor and strangers. The house is popularly called 'Chhattra' meaning a sort of choltry."